IAN WRIGHT HAS branded Arsenal “an absolute shambles”, with problems on and off the field placing the club on a slippery slope. The Gunners crashed into the international break with a 4-0 defeat at Liverpool on Sunday to leave them facing some uncomfortable questions. Arsene Wenger’s ongoing presence at the helm remains an issue for some, including Wright, while the uncertainty surrounding the future of several prominent figures continues to provide an unwelcome distraction. The problems at Emirates Stadium appear to run deep, on the back of a fifth-place finish last season, and a legendary figure from their past is fearing the worst. Wright told BBC Radio 5 Live: “When you go through the list of everything that is going wrong, and you’ve got to throw in recruitment – whoever’s doing the recruitment, someone’s got to have a massive, massive word – it’s an absolute shambles and I’m really gutted for everybody involved. “Where do we start? The amount of things that are going wrong, it does come back to Arsene Wenger’s door. We’re three games in and we’re literally at crisis point. “Do I think he should go? I would like him to go simply because I do not believe now that Arsene Wenger can motivate those players with everything that’s going on above him. “And the way the players are performing on the pitch, for him to turn this around…. (It’s) for himself, for his own sanity. We are three games in and it’s already an absolute nightmare. Arsenal have agreed a £35 million fee with Chelsea for the sale of Alex Oxlade-Chamberlain, while Mesut Ozil and Alexis Sanchez have yet to agree extensions to expiring contracts as exit talk rumbles on. Wright added: “Chelsea want him [Oxlade-Chamberlain] – Chelsea, the champions will take him. That says we obviously have players that are good enough. “If Sanchez and Ozil are free, they will be snapped up. Wright then turned his attention to Wenger, who committed to a new two-year contract earlier in the summer. He said on a man he believes “won’t quit”: “He is literally a hermit to the game. He goes home and he’s probably on his phone. It’s all football and more importantly it’s all Arsenal. You do feel it’s almost like his blanket, his comfort blanket. “If he’s not got Arsenal, I don’t know what would happen to him. “I don’t know what to say about his future and what’s going to happen with him now. Arsenal will not get an opportunity to start righting their wrongs until they face Bournemouth on 9 September, by which time the summer transfer window will have closed and they will be forced to make do until January. Email “'He has to leave for his own sanity': Arsenal legend tears into Arsene Wenger ”. 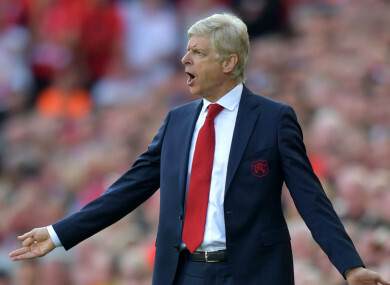 Feedback on “'He has to leave for his own sanity': Arsenal legend tears into Arsene Wenger ”.